Symbols reflect cultural identities and facilitate cultural regeneration. They are used to define what the culture stands for and to help individuals feel an emotional connection to other individuals of the past, present and future. For a country with a short urban history and small population, Australia has a high number of symbols; however, reflecting Australia's diversity, these symbols do not have uniform acceptance. The disproportionately high number of symbols can be attributed to the failure of top-down symbolism to exert compliance or conformity. For example, when ruling authorities tried to promote the Union Jack as a uniting symbol, many Australians reacted by creating their own symbols to defy the authorities and express their culture. Many of these symbols were in turn rejected by the government, which left Australia in a state of disunity and on the look out for new symbols. Today, top-down symbolism still defines much of Australian political life and still fails to exert conformity or compliance just as it failed in the past. In turn, Australians are still seeking new symbols. The Southern Cross is one of the most visible constellations in the Southern Hemisphere and right from the early days of the colony, it was being used to represent Australia. Perhaps the colonists identified with the Christian connotations, and the idea that god was somehow watching over Australia. Perhaps they identified with the four moral virtues of the Southern Cross, justice, prudence, temperance and fortitude, as defined by Dante. Perhaps they identified with the idea of a clear night sky, which was a distinguishing environmental characteristic when compared to Britain’s grey night skies. The Eureka Flag was arguably Australia’s first patriotic symbol. It was designed by a Canadian Digger Lieutenant Ross during the Eureka uprising in Ballarat, Victoria, in 1854. The flag's five stars represent the Southern Cross. The white cross joining the stars represents unity in defiance. The blue background represents the blue shirts worn by the diggers. 500 onlookers then said amen with their hands stretched towards the flag. The rebellion ended in a massacre, which was followed by a host of concessions to the rebels. Peter Lalor became a politician and betrayed his former comrades. Over the following 150 years, the flag was used as a symbol to rally activists around various causes. Miners and shearers used it in their strikes in the 1890s. The Australian Communist Party called its youth wing the Eureka Youth League. Maoists adopted the flag, as did the National Front. The use of the flag alienated conservatives, who were typically loyal to Britain. Today, the flag is used by left-wingers who base their identity on union membership and right-wingers who base their identity on race. Conservatives still don't like it. In 1880, bushranger Ned Kelly led his gang into a shoot out clad in iron suits. His legs were shot out from beneath him, he was captured, tried and hung. Despite being a criminal, something about his iron suit resonated with the general population. Perhaps it has been interpreted to represent an individual armouring himself against persecution, which naturally appealed to a population in which the elitist class were pure British citizens proud of their British culture. Kelly's armour has been incorporated into paintings, advertisements, business logos and is arguably Australia's most proliferated symbol. The Australian Flag was chosen after a competition in 1901. The competition guidelines stipulated that a Union Jack had to be included. Symbolically, the location in the top left-hand corner signals servitude to Britain. The Southern Cross was included to represent Australia. The seven-pointed Commonwealth Star was located beneath the Union Jack to represent Australia's federal system. The presence of the Union Jack has made the flag controversial and unable to be the uniting symbol that a flag should be. Some Australians support the retention of the Union Jack as an acknowledgement of Australian history. Some Australians want the Union Jack replaced with the Aboriginal flag as an acknowledgment of Australian history. Some Australians just don’t want a flag that signals servitude to any other social group. Many of the colonists identified with Australian flowers, much like the English identified with roses, the Scottish with thistles and the Irish with shamrocks. Because of its unique colours and design, the wattle became associated with Australia. In 1912, it was included as decoration surrounding the Commonwealth Coat of Arms. In the 1920s, the green and gold colours of the wattle became associated with Australian sport. Since its inception more than a century ago, the slouch hat has become one of the most distinctive and defining items of Australian clothing. It is made with rabbit-fur or wool felt and has one side of the brim pinned to the side. It has been suggested the pinning made it easier to sling a rifle over the soldier. While that may have been the case, other countries never felt the need to pin one side of their hats to the side in order to sling a rifle over the shoulder. In other words, although the need to sling a rifle over a shoulder was not unique to Australia, no other countries decided to have their soldiers wearing the hat in such a way. Perhaps the Australian soldiers pinned the hat because they put pragmatism over style. Alternatively, military commanders might have encouraged the hat to be pinned because it distinguished Australian soldiers from other soldiers in British allied forces. This distinguishment helped build a unique social identity of the Australian soldiers, which was good for morale. In addition to the pinning, the slouch hat gained uniqueness via the addition of native bird feathers. Emu plumes were often added for decoration or to again signal some kind of Australian characteristic. Simpson would start his day as early as 6.30 a.m. and often continue until as late as 3.00 a.m. He made the one and a half mile trip, through sniper fire and shrapnel, 12-15 times a day. He would leave his donkey under cover whilst he went forward to collect the injured. On the return journey he would bring water for the wounded. He never hesitated or stopped even under the most furious shrapnel fire and was frequently warned of the dangers ahead but invariably replied "my troubles". Simpson's image was seen to embody the ANZAC spirit of abandonment of everything except that which is important. In 1965, to commemorate the 50th anniversary of the ANZAC landings, Australian stamps where issued depicting Simpson, his donkey and a wounded soldier. In 1967, the Australian Government released the ANZAC Commemorative Medallion. It depicted Simpson and his donkey. In 1995, the Australian five dollar commemorative coin was released. Again, it depicted Simpson, his donkey and a wounded soldier. In 1996, the Australian 100 dollar bill was released. It had Simpson and his donkey in the background. The Commonwealth Coat of Arms may have been inspired by the Bowman Flag designed in John and Honor Bowman of Richmond NSW in 1806. The Bowman Flag put a Kangaroo and Emu aside a shield containing an English Rose, a Scottish thistle and an Irish shamrock. Below was the motto, "England expects that every man will do his duty"
In 1886, an unofficial Coat of Arms was designed for the New Atlas Australia. A Kangaroo and Emu looked curiously at a shield depicting the Eureka Southern Cross and four aspects of Australian industry at that time; mining, wool, wheat and tall ships. In 1912, King George V granted the current Coat of Arms but the symbols of industry were replaced with symbols of the six Australian colonies; a Magpie for South Australia, a Black Swan for Western Australia, a Maltese Cross and Crown for Queensland, a Lion for Tasmania, the Southern Cross for Victoria and the lion and stars representing New South Wales. Beneath the Arms are sprays of golden wattle, Australia's official national floral emblem. An oral tradition developed that the Kangaroo and Emu were included because they can’t walk backwards thus symbolising the Australian trait of looking to the future. The Coat of Arms has been used for embellishing the Australian passport, on the back of coins, to stamp something as a Commonwealth initiative, on the uniform of the international representative team of Australian football and has been adapted to make the logo used on the the ‘baggy green’ cricket cap. Arguably, it is the most widely accepted symbol in Australia. Dot painting has been used to symbolise Aboriginal culture, and to a minor extent, Australian culture in general. The dot patterns are used on souvenirs, uniforms of Qantas staff, and wine bottles. The style developed in the 1970s when a white school teacher north of Alice Springs, Geoffrey Bardon, encouraged children to paint a mural using traditional body and sand painting techniques. Using acrylics, the children created a new style of painting. Complete acceptance of dot painting as a symbol of Australia has been complicated by a number of issues. Firstly, the stye is seen more as representative of Aborigines that all Australians. Even using it to define Aborigines is problematic. Because the style evolved from a traditional art form that was used in only one region of Australia it is not a true reflection of all Aborigines. In other words, using it to define Aborigines as a whole is a bit like using the English rose to define Europeans. Admittedly, culture usually has its genesis in one small area and subsequently spreads out over a wider area. The dot pattern could do the same. There are plenty of Aborigines with no traditional association with dot painting that now use the dots in their art. Potentially, non-Aborigines could also assimilate the style. The incorporation of the dot pattern into a number of different designs indicates that there are many non-Aborigines that want to use the pattern to define themselves. Additionally, the genesis of the style was an example of cultural fusion. In 1983, the yacht Australia II ended the Americans 132 year dominance of the America's cup; however, it was the manner of the victory rather than the prize itself that inspired the nation. The yacht's 'winged keel' reflected Australian innovative thinking whilst the very fact that they dared challenged American supremacy typified the Australian underdog's sense of self belief. In subsequent celebrations, wealthy and common Australians cheered side by side, typifying the egalitarian ethic that every democratic society tries to promote. The Boxing Kangaroo was the marketing icon of this victory and like the yacht race, it struck a chord with the Australian public. There have been calls for the boxing kangaroo flag to replace the official flag but critics say it is not sombre enough and associates Australia too closely with sport. The boomerang was a unique hunting tool, weapon and ritualised implement used by Aboriginal tribes. The curved wings allowed the boomerang to fly, with the spin producing lift much like a helicopter. The boomerang shape is used in logos and boomerangs are sold in souvenir stores. The appeal of the boomerang could be its recognisability as Australian, its ingenuity, or the idea of something coming back. It is one of the few Aboriginal-origin symbols that can be used freely in non-Aboriginal society without accusations of cultural theft or politicising. The VB logo is quite an unusual symbol to express patriotism. Even though other cultures love beer, none would wear beer t-shirts to signal which country they come from, or wave beer cartoons in preference to their national flag. The popularity of VB as a national symbol probably goes the classic VB commercials that incorporated environmental imagery of Australia with a variety of Australian professions to create a strong Australian image. This image seemed more have more emotional resonance than that conveyed by symbols such as the national flag. Vegemite is a bread spread that is made from expired beer yeast. Although the recipe is unique, it is similar to the English spread Marmite in taste. Perhaps the appeal of Vegemite can be attributed to the fact that most foreigners hate it. Many foreigners think it looks, smells and tastes like faeces. World rejection has helped Vegemite become something that can help define Australians as unique. Despite not liking Opera, Australians probably like the Opera House because it seems to represent a water and beach culture. The Opera House’s design looks a bit like shells on a beach or sails on the water. Uluru rises from Australia’s flat desert centre. Because the outback has traditionally had a central role in the Australian identity, the rock has been used as a symbolic heart of the outback. The rainbow serpent was a mythological figure in many Aboriginal cultures. The Aborigines told of a great snake that emerged from beneath the earth, winding from side to side, making the great rivers flow from its path. From its body sprang the tribes, the animals and the birds of Australia. It was spoken upon in a hushed voice for it inflicted vengeance upon those who angered it. Stories told of it swallowing people who had not observed taboos. Contrary to myth, it was not the universal creation spirit. Some cultures told of a dingo that created the world. Today, the rainbow serpent has been incorporated into artwork that symbolises the interconnectivity of Aboriginal cultures with the environment. In Aboriginal protest marches in 1960s and early 1970s, Aborigines were outnumbered by non-Aborigines wanting to show their support. Being outnumbered by whites was a concern to Aboriginal artist Harold Thomas, so in 1971 he designed the Aboriginal flag. Thomas hoped it would be a rallying symbol to get more Aborigines to come along, and also signal Aborigines as a distinct group. The black is said to represent the Aboriginal people, the red the earth and their spiritual relationship to the land, and the yellow the sun, the giver of life. Thomas said he deliberately put black on top of the red to make the flag appear more disturbing and reflect its protest function. The Aboriginal flag was first raised in Victoria Square in Adelaide on National Aboriginal Day in 1971. It was adopted nationally by Aborigines after it was flown above the Aboriginal "Tent Embassy" outside of the old Parliament House in Canberra. Ironically, many governments now fly the Aboriginal flag aside the official flag. A further irony is that many non-Aborigines want to be represented by the flag as well. So much so, they have called for the flag to replace the Union Jack on Australia's official flag. This is unlikely to occur as Harold Thomas has declared his desire for it to remain separate. It was, afterall, his chief reason for designing it. The opal has all the characteristics to become a national symbol. Australia produces 96% of the world’s commercial opal and it is a gemstone that matches almost all items clothing. In 1993, it was named Australia’s official gemstone. Despite being beautiful, officially sanctioned and unique to Australia, it is rare to see Australians wearing opal jewellery. Instead, most opal is exported or sold through souvenir shops. In some ways, Opal is the Fosters of the gem world. A very common depiction of the Australian man is an informal looking cartoon character with a smile. 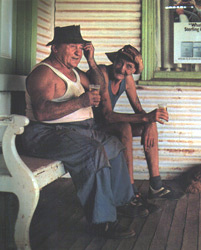 Often the character is adorned with Australian inventions such as a cork hat or a stubby holder. The depiction is often seen on souvenir t-shirts, stubby holders and on internet sites trying to portray a fair dinkum Aussie feel.